UNIX was designed to allow transparent access to hardware devices across all CPU architectures. UNIX also supports the philosophy that all devices be accessible using the same set of command-line utilities. /dev/hda is not really a file at all. When you read from it, you are actually reading directly from the first physical hard disk of your machine. /dev/hda is known as a device file, and all of them are stored under the /dev directory. They read and write to the device to send and retrieve bulk data (much like less and cat above). Because every kind of device that one can think of (except for network cards) can be twisted to fit these two modes of operation, UNIX's scheme has endured since its inception and is the universal method of accessing hardware. Hardware devices can generally be categorized into random access devices like disk and tape drives, and serial devices like mouse devices, sound cards, and terminals. A list of common devices and their descriptions follows. The major numbers are shown in parentheses. 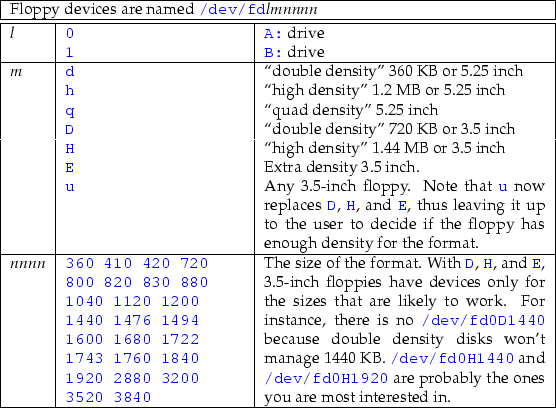 The complete reference for devices is the file /usr/src/linux/Documentation/devices.txt. First drive, or primary master. Second drive, or primary slave. Third drive, or secondary master. Fourth drive, or secondary slave. When accessing any of these devices (with, say, less /dev/hda), you would be reading raw from the actual physical disk starting at the first sector of the first track, sequentially, until the last sector of the last track. Partitions [With all operating systems, disk drives are divided into sections called partitions. A typical disk might have 2 to 10 partitions. Each partition acts as a whole disk on its own, giving the effect of having more than one disk. For instance, you might have Windows installed on one partition and LINUX installed on another. More details come in Chapter 19. ]are named /dev/hda1, /dev/hda2, etc., indicating the first, second, etc., partition on physical drive a.
sd stands for SCSI disk, the high-end drives mostly used by servers. sda is the first physical disk probed, and so on. Probing goes by SCSI ID and has a system completely different from that of IDE devices. /dev/sda1 is the first partition on the first drive, etc. These are serial devices numbered from 0 up. /dev/ttyS0 is your first serial port (COM1 under MS-DOS or Windows). If you have a multiport card, these can go to 32, 64, and up. A symlink to /dev/ttyS0 or /dev/psaux. Other mouse devices are also supported. A symlink to /dev/ttyS1 or whatever port your modem is on. Identical to ttyS? but now fallen out of use. Floppy disk. fd0 is equivalent to your A: drive and fd1 your B: drive. The fd0 and fd1 devices autodetect the format of the floppy disk, but you can explicitly specify a higher density by using a device name like /dev/fd0H1920, which gives you access to 1.88 MB, formatted, 3.5-inch floppies. Other floppy devices are shown in Table 18.1. See Section 19.3.4 on how to format these devices. Parallel port. /dev/par0 is your first parallel port or LPT1 under DOS. Line printer. Identical to /dev/par?. Random number generator. Reading from this device gives pseudo-random numbers. SCSI tape. SCSI backup tape drive. Produces zero bytes, and as many of them as you need. This is useful if you need to generate a block of zeros for some reason. Use dd (see Section 18.5.2) to read a specific number of zeros. Null device. Reads nothing. Anything you write to the device is discarded. This is very useful for discarding output. SCSI CD-ROM (Identical, alternate name). SCSI generic. This is a general-purpose SCSI command interface for devices like scanners. Frame buffer. This represents the kernel's attempt at a graphics driver. A symlink to /dev/hda, /dev/hdb, or /dev/hdc. It can also be linked to your SCSI CD-ROM. Virtual console. This is the terminal device for the virtual console itself and is numbered /dev/tty1 through /dev/tty63. Other TTY devices used for emulating a terminal. These are called pseudo-TTYs and are identified by two lowercase letters and numbers, such as ttyq3. To nondevelopers, these are mostly of theoretical interest. /dev/modem should not be used for a modem which supports dial-in as well as dialout, as it tends to cause lock file problems. If it exists, /dev/modem should point to the appropriate primary TTY device (the use of the alternate callout devices is deprecated). For SCSI devices, /dev/tape and /dev/cdrom should point to the ``cooked'' devices ( /dev/st* and /dev/sr*, respectively), whereas /dev/cdwriter and /dev/scanner should point to the appropriate generic SCSI devices ( /dev/sg*). /dev/mouse may point to a primary serial TTY device, a hardware mouse device, or a socket for a mouse driver program (e.g. /dev/gpmdata). Note that dd is an unforgiving and destructive command that should be used with caution. This command writes the raw disk image directly to the floppy disk. All distributions will have similar disk images for creating installation floppies (and sometimes rescue floppies). will write zeros to the first 10 megabytes of your first IDE drive. This will wipe out the partition table as well as any file system information and give you a ``brand new'' disk. which gives x86 boot sector, system )k?/bIHC, FAT (12 bit) for DOS floppies. to copy the entire disk and avoid having to install an operating system from scratch. It doesn't matter what is on the original (Windows, LINUX, or whatever) since each sector is identically duplicated; the new system will work perfectly. rewind scsi tape 0 and archive the /home directory onto it. You should not try to use compression with tape drives because they are error prone, and a single error could make the entire archive unrecoverable. The mt command stands for magnetic tape and controls generic SCSI tape devices. See also mt(1). If you don't want to see any program output, just append > /dev/null to the command. For example, we aren't often interested in the output of make. [ make is discussed later. ]Here we absorb everything save for error messages. The device /dev/null finds innumerable uses in shell scripting to suppress the output of a command or to feed a command dummy (empty) input. /dev/null is a safe file from a security point of view. It is often used when a file is required for some feature in a configuration script, and you would like the particular feature disabled. For instance, specifying the users shell to /dev/null inside the password file will certainly prevent insecure use of a shell, and is an explicit way of saying that that account does not allow shell logins. The letters b and c are for creating a block or character device, respectively. Note carefully the mode (i.e., the permissions) of /dev/fd0. /dev/fd0 should be readable and writable only to root and to users belonging to the floppy group, since we obviously don't want an arbitrary user to be able to log in (remotely) and overwrite a floppy disk. In fact, this is the reason for having devices represented as files in the first place. UNIX files naturally support group access control, and therefore so do devices. To create devices that are missing from your /dev directory (some esoteric devices will not be present by default), simply look up the device's major and minor number in /usr/src/linux/Documentation/devices.txt and use the mknod command. This procedure is, however, somewhat tedious, and the script /dev/MAKEDEV is usually available for convenience. You must be in the /dev directory before you run this script. to create a complete set of floppy disk devices.